You’ve come to the right place to find tips on boat paint application, boat maintenance and repair. This section will be growing over time. 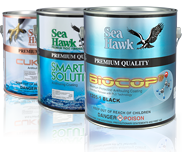 So please check back to read the latest tips from Sea Hawk Paints.